Allen Carstensen's guest column in the Ithaca Journal the other day was a good one. I've quoted it in full below, and added emphasis as well as a few comments. Our government is planning the biggest theft in the history of the world. Both Republicans and Democrats are to blame, and the media are not covering it. The Bush administration has crafted an Iraqi hydrocarbon law and is pressuring the Iraqi Parliament to pass it as one of the benchmarks necessary for continued U.S. support of their government. This document pays lip service to the fair and even distribution of profit among the various sects, but a careful look reveals that it allows huge multinational oil companies to take 80 percent of Iraq's oil wealth. It's 87.5% as I read it, but still a bad case of "spoils" to the "victor", in this unprovoked war of choice. Despite the objections from Kucinich, the Congress passed the Iraq Supplemental Bill, including language requiring the privatization of Iraq's oil resources as a benchmark for U.S. support of the corrupt Iraqi government. Bush signed it into law on May 25. Bush will have to ask Congress for another appropriations bill in September. If our representatives felt enough pressure from the people, they could draft the new bill with language that made it clear that the U.S. and the multinational oil companies have no right to control what Iraq does with its oil. If not, then we have proof beyond any doubt remaining in our minds that this war is about oil. Our representatives clearly have no intention of drafting any such law and we have already had more than enough proof of what this war is about in my humble view. But then I am one of the fringe lunatics and Allen Carstensen's reputation is not as fully besmirched -- at least not on this frozen page. Vice President Cheney said to Tim Russert on Sept. 13, 2003, “Iraq sits on top of 10 percent of the world's oil reserves — a very significant reserve, second only to Saudi Arabia. The fact is, there are significant resources here to work with.” Most of the oil producing countries in the world have nationalized their oil production. Iraq nationalized its in 1972. It's very clear that the intention of our government from the beginning was to privatize those resources. 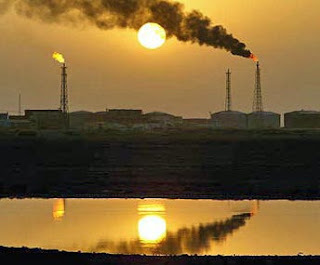 The Center for Global Energy Studies estimates that Iraq could produce 300 billion barrels of oil. At $70 per barrel, that comes to about $21 trillion — nearly twice the gross national product of our entire country. No wonder Bush defaulted on his electioneering promise that he was against regime change and lied to us about reasons for invading Iraq. Everyone in Iraq may know this, but the US population is much less informed on this point. Clearly, and most unfortunately, this is only crucial point on which the US people are poorly informed. Vice President Cheney called together his Oil and Energy working group four times between December 2002 and April 2003. The transcripts have not been released, and Cheney will not even tell us who was there. Cheney recently visited Iraq to urge passage of the Hydrocarbon Act. The passing of the Hydrocarbon Act has been the most significant benchmark ever since the concept of benchmarks came to the fore. At 10 a.m. on April 4, 2001, representatives of 13 environmental groups were brought into the Old Executive Office Building for a long-anticipated meeting. Since late January, a task force headed by Vice President Cheney had been busy drawing up a new national energy policy, and the groups were getting their one chance to be heard. Cheney was not there, but so many environmentalists were in the room that introductions took up "about half the meeting," recalled Erich Pica of Friends of the Earth. Anna Aurilio of the U.S. Public Interest Group said, "It was clear to us that they were just being nice to us." A confidential list prepared by the Bush administration shows that Cheney and his aides had already held at least 40 meetings with interest groups, most of them from energy-producing industries. By the time of the meeting with environmental groups, according to a former White House official who provided the list to The Washington Post, the initial draft of the task force was substantially complete and President Bush had been briefed on its progress. In all, about 300 groups and individuals met with staff members of the energy task force, including a handful who saw Cheney himself, according to the list, which was compiled in the summer of 2001. For six years, those names have been a closely guarded secret, thanks to a fierce legal battle waged by the White House. Some names have leaked out over the years, but most have remained hidden because of a 2004 Supreme Court ruling that agreed that the administration's internal deliberations ought to be shielded from outside scrutiny. Some people might think that it makes sense to use Iraq's oil wealth to pay for the war. I would point out to those misguided souls that this hydrocarbon law is not designed to benefit the American taxpayer who is paying for this war. It is designed to benefit Exxon/Mobil, Chevron, Shell and British Petroleum. Absolutely true. But who is really paying for this war? Not the American taxpayer, but the people of Iraq! This hydrocarbon law was made a part of the Iraq Supplemental Bill by a Congress under the control of the Democratic Party. This is a sad reflection on the nature of both parties. I hope it is not a reflection on the American people. I hope we are better than that. I hope that Americans would not want to use military force to steal the resources of another country. I hope that Americans would not want to trade blood for oil. If you agree perhaps you should call your congressmen and senators. I agree with every principle Allen Carstensen has espoused here, although clearly he is a shade or two more hopeful -- and more trusting -- than I am at this point. Nonetheless, I urge you to take some action while you still can. Maybe Allen Carstensen is right. We'll never know until we try.